Coach Paul Rowley admitted Leigh were “a broken team” after they slumped to a 50-6 defeat at Widnes to finish bottom of the Super 8s Qualifiers. 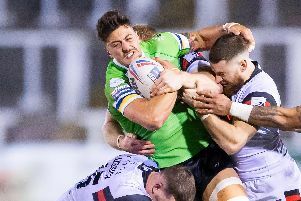 Widnes wrapped up their season with a nine-try show to leave Leigh with only one win from seven matches in the Super 8s. Rowley said: “We are a very broken team and have been for a few weeks. “We bombed several clear-cut chances and then topped it off by showing how poor we can get in the middle eights. The Centurions took the lead with an early Ben Reynolds try but the Vikings hit back to stroll to victory in the first match between the clubs since 2011. Patrick Ah Van, Kevin Brown, Charly Runciman and Paddy Flynn replied with touchdowns to give Widnes a 20-6 interval lead. The Vikings, who handed youngster Jay Chapelhow his debut off the bench, added further tries in the second half from Alex Gerrard, Rhys Hanbury, Joe Mellor, Ah Van and Jack Owens, with Danny Tickle booting five goals and Owens adding another two. There was nothing but pride at stake for Leigh who were hotly fancied to figure in the “million pound” promotion showdown which will now be contested by Wakefield and Bradford on Saturday. Rowley added: “Our boys hobbled on the field and hobbled off but have tried really hard. “We lost only two games in the championship and are still the only side in the division to win any silverware. “But it’s like I’ve been to the cinema to see a really good film and watched a very poor ending. “Perhaps we should try and reprogramme for next year and finish second or third instead of top and come into the middle eights a bit fresher. Leigh trailed only 10-6 when Gareth Hock was sin-binned for a high tackle on Hanbury and Widnes then ran in two tries. Widnes coach Denis Betts said: “It was a fantastic way to finish and just what we wanted to do. “Our objective was to stay in Super League and we’ve done that. “To keep Leigh down to six points is a really good effort and our defence has been strong in the middle eights.